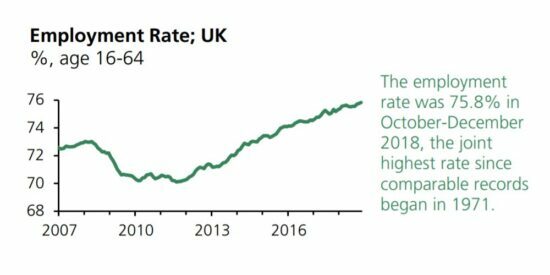 The UK employment rate was 75.8% in October-December 2018, the joint highest rate since comparable records began in 1971. The UK unemployment rate was 4.0% in October-December 2018, the joint highest rate since 1975. 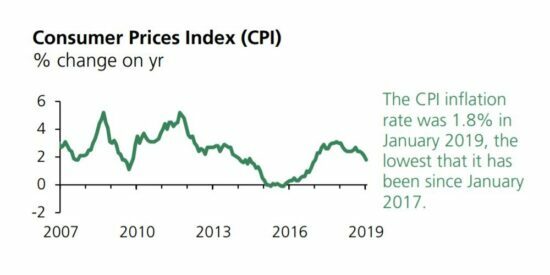 The UK CPI inflation rate was 1.8% in January 2019, the lowest that it has been since January 2017. The economic data for the final quarter of 2018 provided mixed news. While employment levels continue to rise, economic growth weakened in the final quarter of 2018. Quarterly GDP growth in Q4 2018 was just 0.2%, with particular weaknesses in car and steel production, and construction. • The services sector grew by 1.7%, the lowest growth since 2011. • The production sector, which includes manufacturing, grew by 0.7%, the lowest growth since 2013. • The construction sector grew by 0.6%, the lowest growth since 2012. Prior to the publication of this latest data, the Bank of England’s Monetary Policy Committee (MPC) published its February Inflation Report. Within this report, the MPC indicated that it expected the subdued growth to continue into 2019, cutting its GDP forecast for 2019 from 1.7% to 1.2%. 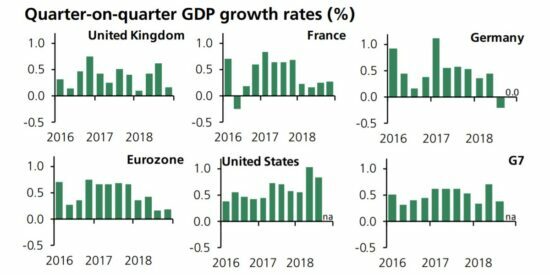 It should be noted that the economic growth seen in the UK in 2018 was higher than growth seen in various other countries. 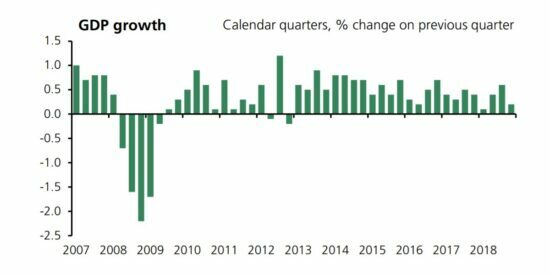 In the year to Q4 2018, the UK grew by 1.3%. This was slightly higher than growth in the Eurozone (1.2%), and was higher than growth in Germany (0.6%) and France (0.9%). The final quarter of 2018 saw another large increase in employment. 167,000 more people were in employment in Q4 2018 than in the previous quarter, meaning that there were almost 450,000 more people in employment at the end of 2018 than there were at the end of 2017. The employment rate of 75.8% in Q4 2018 was the joint highest level ever recorded. 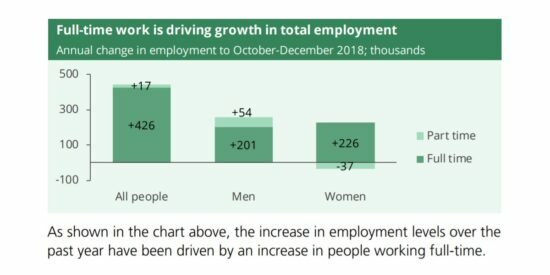 As shown in the chart above, the increase in employment levels over the past year have been driven by an increase in people working full-time. 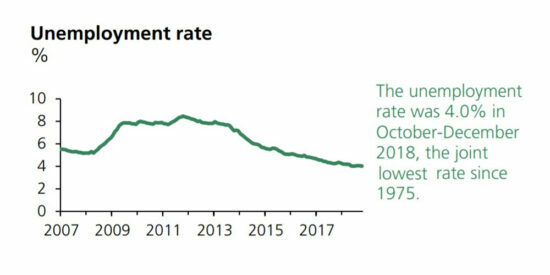 Unemployment also remains at a very low historical level, and the unemployment rate of 4.0% at the end of 2018 was the joint lowest level since 1975. 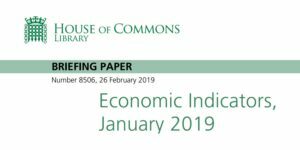 The CPI inflation rate in January 2019 was 1.8%, the first time that inflation has been below the Bank of England’s inflation target of 2% since January 2017. The inflation rate gradually slowed throughout 2018, down from 3.0% in January 2018. The MPC forecasts that inflation will remain around 2% in 2019. In contrast, average pay growth continued to accelerate, with a 3.4% increase in average earnings in the final quarter of 2018. Real (inflation adjusted) average earnings growth rose to 1.1% in this quarter. The last time growth was above 1% was back in 2016. 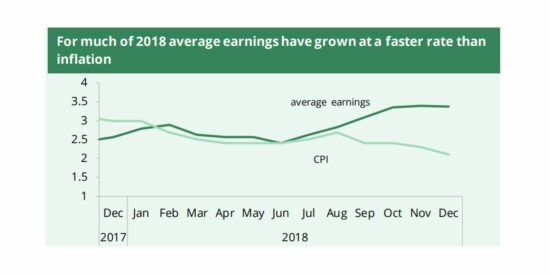 For much of 2018 average earnings have grown at a faster rate than inflation. In February, the Bank of England’s Monetary Policy Committee (MPC) voted unanimously to keep interest rates at 0.75%. 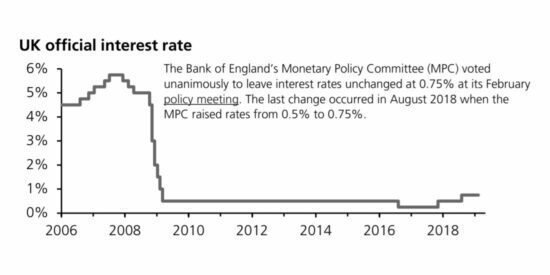 The MPC also indicated that they expect there to be little movement in interest rates over the next couple of years. See Section 5 for information on the sources used in this table. GDP in the UK grew by 0.2% in October-December 2018 compared to the previous quarter. 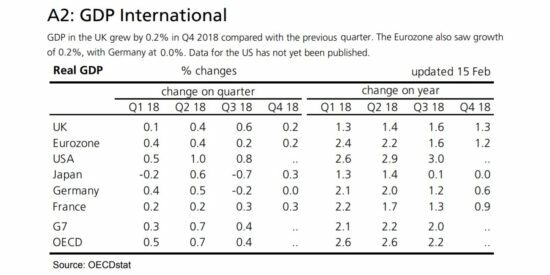 Growth was 0.2% in Q4 2018, which compared to growth of 0.2% in the Eurozone. 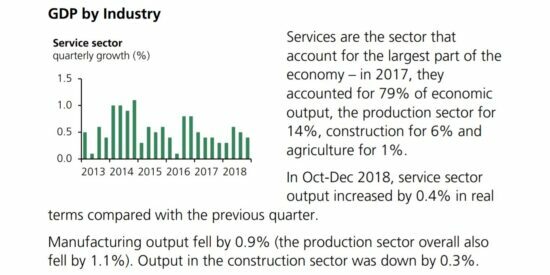 Services output was up by 0.4% in October-December 2018 compared to the previous quarter. Manufacturing output fell 0.9%. CPI inflation was 1.8% in January 2019, down from 2.1% in December 2018. 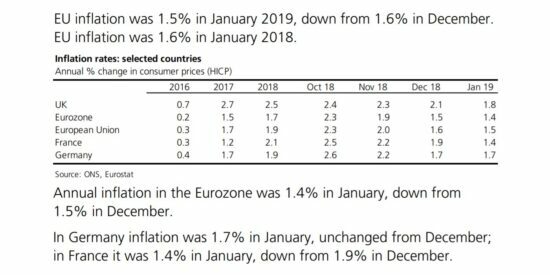 Inflation in the Eurozone was 1.4%. The Bank of England’s Monetary Policy Committee (MPC) voted unanimously to leave interest rates unchanged at 0.75% at its February policy meeting. They were raised from 0.5% in August 2018. Average wages excluding bonuses were 3.4% higher in the three months to December 2018 compared with the year before. CPI inflation for this period was 2.3%. 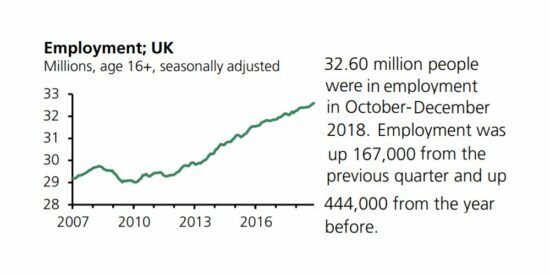 32.6 million people were in employment in October-December 2018, up 444,000 from a year before. The employment rate was 75.8%, the highest rate since comparable records began in 1971. 1.36 million people were unemployed in October-December 2018, down 100,000 from the year before. The unemployment rate was 4.1%, the joint lowest since 1975. The UK harmonised unemployment rate for Q3 2018 was the 13th lowest of the 36 OECD countries. 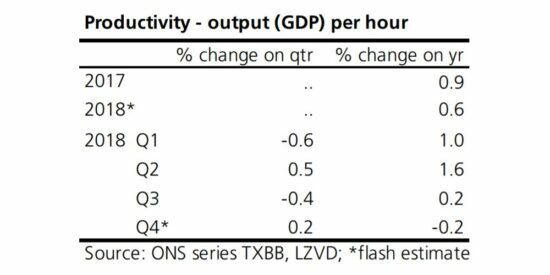 Productivity across the whole UK economy rose by 0.2% in Q4 2018 compared with the previous quarter. Compared with the previous year, productivity was down by 0.2% in Q4 2018. 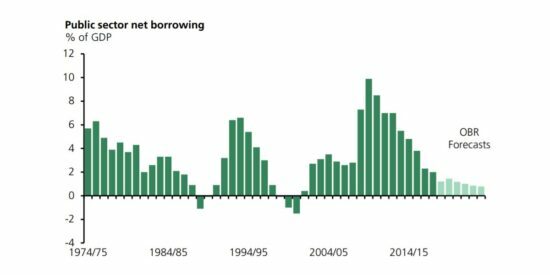 Government borrowing between April 2018 and January 2019 was £21 billion, £19 billion less than the same period in 2017/18. At the end of January 2019, public sector net debt was equivalent to 82.6% of GDP, down from 83.4% in January 2018. The UK had a trade deficit of £10.4 billion in the three months to December 2018, compared with £9.5 billion in the previous three months. 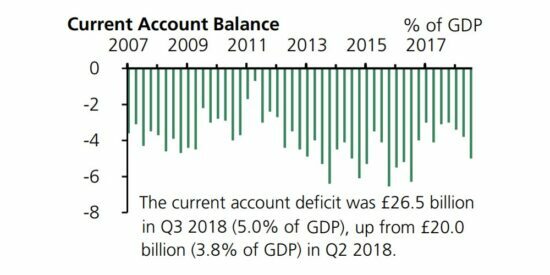 The current account deficit was £26.5 billion in Q3 2018 (5.0% of GDP), up from £20.0 billion in Q2 2018 (3.8% of GDP). As of 25 February the FTSE-100 Index was up 6% compared with a month ago and down 1% on a year ago. The value of sterling rose by 1.4% between December and January, following a fall of 2.0% between November and December. This was the largest month on month increase since April 2018. The volume of retail sales decreased by 0.7% in the three months to January 2019 compared with the previous three months, but increased by 3.5% compared with the previous year. House prices increased by 2.5% in the year to December 2018. 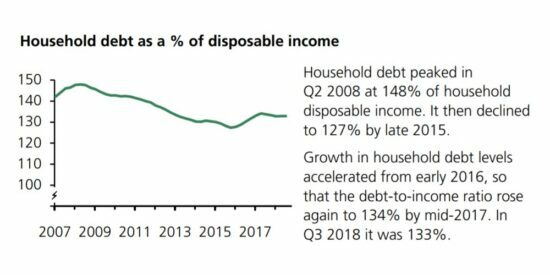 Household debt stood at 133% of disposable income in Q3 2018. It has been around this level since mid-2017. The economy grew by 0.2% in October-December 2018 compared to the previous quarter (July-September). GDP increased by 0.2% in October-December 2018 compared with the previous quarter. At the October 2018 Budget, the Office for Budget Responsibility (OBR) forecast growth of 1.3% for 2018 and 1.6% for 2019. The Treasury’s February 2019 survey of independent forecasts https://www.gov.uk/government/collections/data-forecasts for GDP growth showed an average forecast of 1.4% for 2019 and 1.6% for 2020. 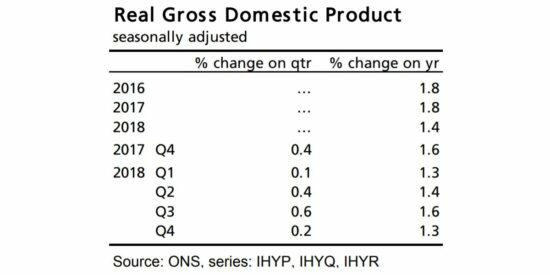 GDP in the UK grew by 0.2% in Q4 2018 compared with the previous quarter. The Eurozone also saw growth of 0.2%, with Germany at 0.0%. Data for the US has not yet been published. 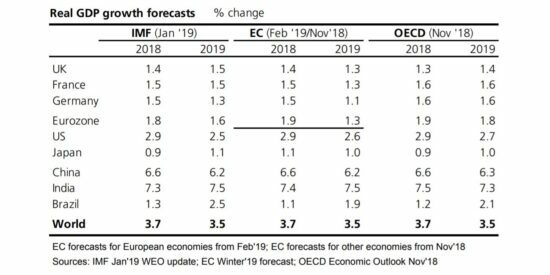 The European Commission released new forecasts on 7 February, downgrading its forecasts for 2019 Eurozone growth from 1.9% at the time of its previous November forecast to 1.3%. This reflects weakening growth prospects in Germany and Italy, in particular. GDP can be analysed in terms of the output produced by different industries in the economy, or alternatively by expenditure on goods and services made by households, businesses and the government. Overall, GDP is estimated to have increased by 0.2% in real terms in Oct-Dec 2018 compared with the quarter before. In Oct-Dec 2018, service sector output increased by 0.4% in real terms compared with the previous quarter. 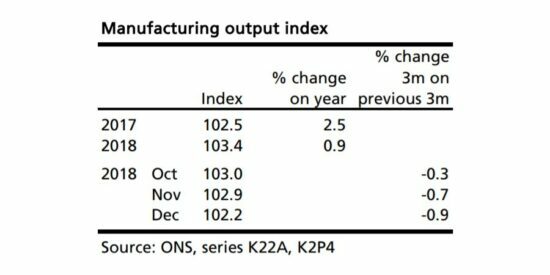 Manufacturing output fell by 0.9% (the production sector overall also fell by 1.1%). Output in the construction sector was down by 0.3%. Household consumption is the largest element of expenditure across the economy, accounting for 63% of the total in 2018. Government consumption accounted for 18% and investment for 17%. 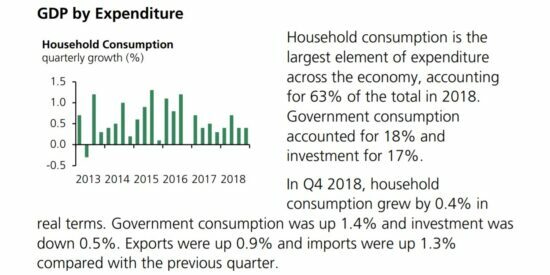 In Q4 2018, household consumption grew by 0.4% in real terms. 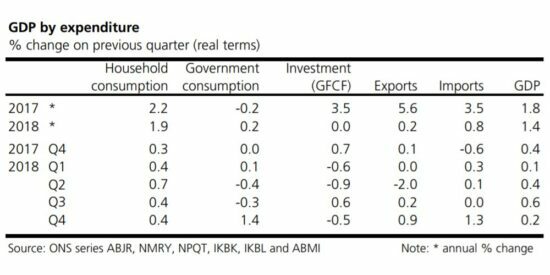 Government consumption was up 1.4% and investment was down 0.5%. Exports were up 0.9% and imports were up 1.3% compared with the previous quarter. One of the most important factors in determining living standards is productivity – how much output is produced for a given input (such as an hour of work). The more efficient the economy is, the more that can be produced in a sustainable fashion. In other words, higher productivity growth leads to a higher long-term growth rate of the economy. Economic theory states that labour productivity also determines wages: the more productive an employee is, the more they are likely to be paid. 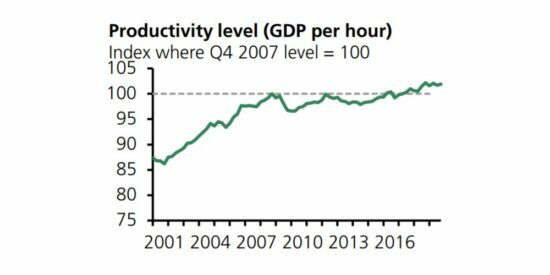 Historically, UK labour productivity has grown by around 2% per year but since the 2008/2009 recession it has stagnated. The level of labour productivity in Q4 2018 was 1.9% above what it was 11 years earlier in Q4 2007 (the pre-recession peak level). Productivity rose by 0.2% in Q4 2018 compared with the previous quarter, following a 0.4% decline in the previous quarter. Compared with a year ago, productivity was down by 0.2% in Q4 2018. For 2018 as a whole, productivity rose by 0.6% (based on preliminary estimates). Productivity levels are 1.9% above the pre-financial crisis peak of late 2007.
International comparisons of productivity levels are presented in the chart below as an index where the UK=100. In 2016, ranked on GDP per hour worked, the UK came fifth highest out of the G7 countries, with Germany top and Japan bottom. UK productivity was 16% below the average of the rest of the G7 countries, the largest since at least 1995 (when the ONS data series began). 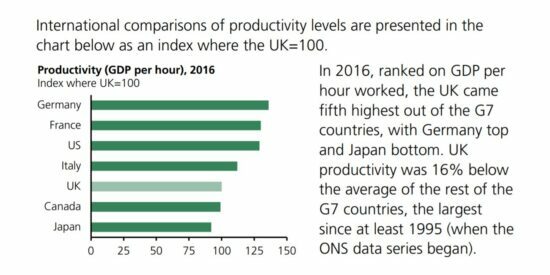 Recent new evidence from the OECD showed that the UK’s productivity gap with the G7 average is not as great as previously thought, due to the different ways countries measure hours worked. The ONS is exploring this research. The service industries include the retail sector, the financial sector, the public sector, business administration, leisure and cultural activities. In 2017, the service industries accounted for 79% of total UK economic output (Gross Value Added). Services accounted for 83% of workforce jobs in September 2018. 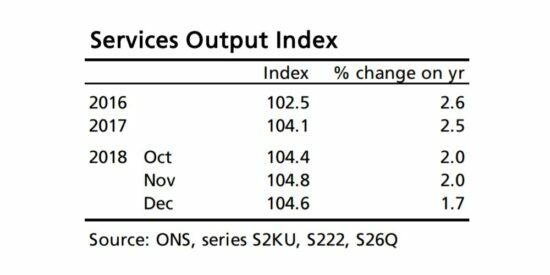 In the three months to December 2018, services output increased by 0.4% compared with the three months ending September 2018. The professional, scientific and technical activities sector made the largest contribution to this growth. 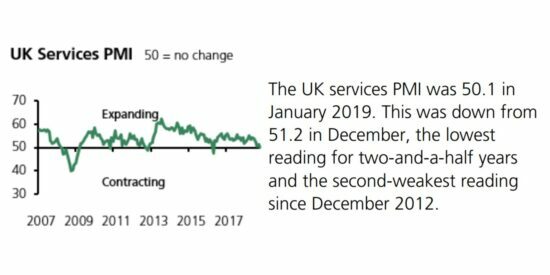 Services output decreased by 0.2% between November and December, the lowest monthly growth since February 2018. 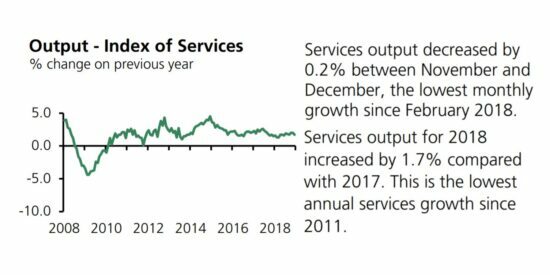 Services output for 2018 increased by 1.7% compared with 2017. This is the lowest annual services growth since 2011. In the Markit/CIPS PMI, a value of 50 means that there is no change compared to the previous month. Values above 50 indicate an expansion, and values below 50 a contraction. 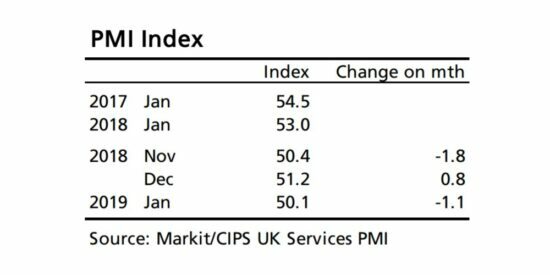 The UK services PMI was 50.1 in January 2019. This was down from 51.2 in December, the lowest reading for two-and-a-half years and the second-weakest reading since December 2012. Political uncertainty was cited as a prime reason for caution. There was a small fall in employment, combined with higher pay adding to input costs. Business confidence rebounded slightly from December’s 29-month low, but was still one of the lowest seen since early 2009. Manufacturing is one of the production industries, which also include mining, electricity, water & waste management and oil & gas extraction. In 2018, the manufacturing sector accounted for 10% of total UK economic output (Gross Value Added). In September 2018, it accounted for 8% of jobs. 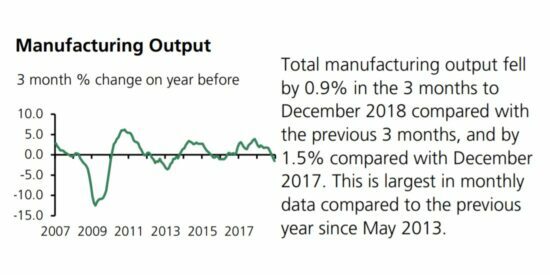 Total manufacturing output fell by 0.9% in the 3 months to December 2018 compared with the previous 3 months, and by 1.5% compared with December 2017. This is largest in monthly data compared to the previous year since May 2013. 11 out of 13 of the manufacturing sub-sectors decreased in the 3 months to December, highlighting widespread weakness across the sector. 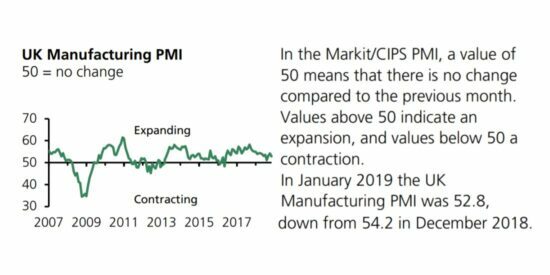 In the Markit/CIPS PMI, a value of 50 means that there is no change compared to the previous month. Values above 50 indicate an expansion, and values below 50 a contraction. 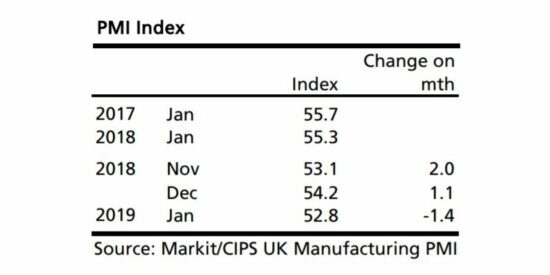 In January 2019 the UK Manufacturing PMI was 52.8, down from 54.2 in December 2018. The January figure was the second lowest figure since July 2016. In January, output and new orders slowed and employment fell for only the second time in the past two-and-a-half years. Meanwhile, Brexit preparations led to a sharp rise in purchasing activity and stockpiling of inputs at warehouses. The degree of positive sentiment regarding the forthcoming year dipped to a 30-month low. The Consumer Prices Index (CPI) is the main measure of inflation. It is produced in line with international standards and is the measure used for the Bank of England’s 2% inflation target. The Retail Prices Index (RPI) is no longer classified as a National Statistic as the way it is calculated does not meet international standards. It is included here as it is well-known and is the longest running measure of inflation. The CPI inflation rate was 1.8% in January 2019, the lowest that it has been since January 2017. 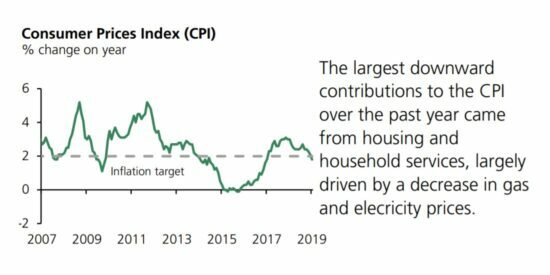 The largest downward contributions to the CPI over the past year came from housing and household services, largely driven by a decrease in gas and electricity prices. 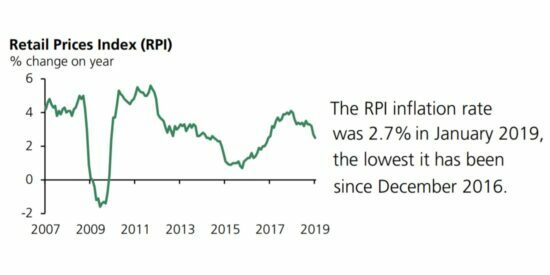 The RPI inflation rate was 2.7% in January 2019, the lowest it has been since December 2016. 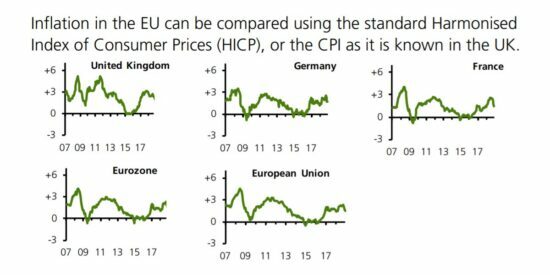 Inflation in the EU can be compared using the standard Harmonised Index of Consumer Prices (HICP), or the CPI as it is known in the UK. 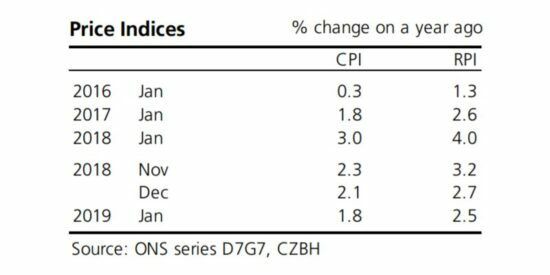 UK inflation, as measured by the CPI, was 1.8% in the year to January 2019, down from 2.1% in December. This is the lowest level of inflation since January 2017. EU inflation was 1.5% in January 2019, down from 1.6% in December. EU inflation was 1.6% in January 2018. Annual inflation in the Eurozone was 1.4% in January, down from 1.5% in December. In Germany inflation was 1.7% in January, unchanged from December; in France it was 1.4% in January, down from 1.9% in December. 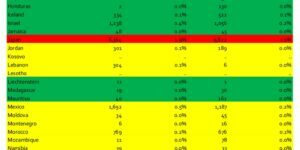 Romania had the highest inflation rate in the EU in January (3.2%). The lowest inflation rate in the EU was in Greece (0.5%). UK inflation was the joint eleventh highest in the EU in January. In April 2018 median gross weekly earnings for full-time employees in the UK were £569, up 3.5% on April 2017. This was the highest growth in earnings since 2008. Adjusted for inflation, median earnings for full-time employees increased by 1.2%. 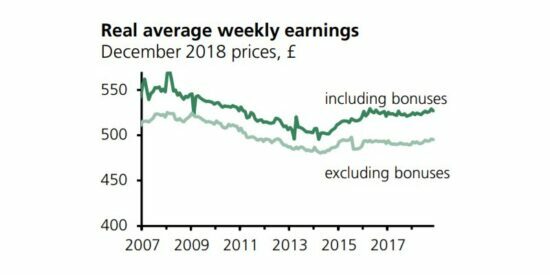 More timely but less detailed data show average weekly earnings for all employees in Great Britain increased by 3.4% both including and excluding bonuses in the three months to December 2018 compared with the previous year. Inflation as measured by the CPI averaged 2.3% over the same period. 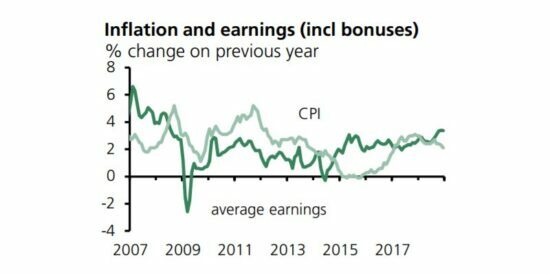 After adjusting for inflation, average weekly earnings including and excluding bonuses were 1.1% higher than the previous year. 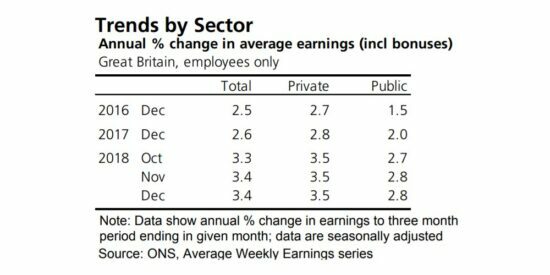 Average weekly total pay (including bonuses) grew by 3.5% in the private sector and by 2.8% in the public sector in the three months to December 2018 compared with the year before. 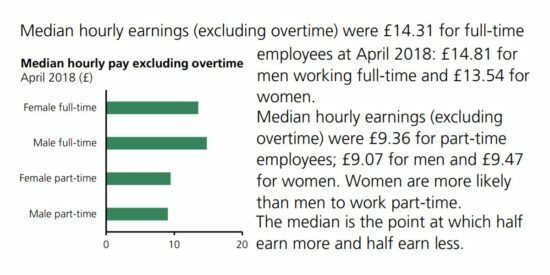 Median hourly earnings (excluding overtime) were £14.31 for full-time employees at April 2018: £14.81 for men working full-time and £13.54 for women. Median hourly earnings (excluding overtime) were £9.36 for part-time employees; £9.07 for men and £9.47 for women. Women are more likely than men to work part-time. The median is the point at which half earn more and half earn less. 32.60 million people were in employment in October-December 2018. Employment was up 167,000 from the previous quarter and up 444,000 from the year before. The employment rate (the proportion of the population aged 16-64 in work) was 75.8%, up from 75.6% in the previous quarter. This is the joint highest rate since comparable records began in 1971. It compares to a post-recession low of 70.1% in July-September 2011. 15.31 million women were in work, an increase of 78,000 from the previous quarter and 188,000 more than a year ago. The female employment rate was 71.4%. Increases in the rate over recent years are partly due to changes to the State Pension age for women. 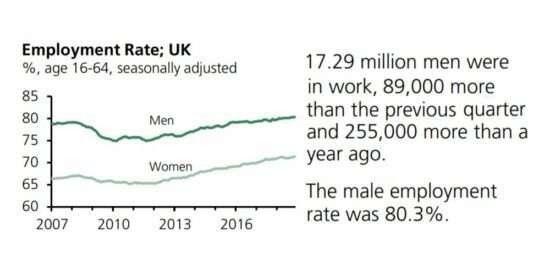 17.29 million men were in work, 89,000 more than the previous quarter and 255,000 more than a year ago. The male employment rate was 80.3%. 24.04 million people were working full-time, up 108,000 from the previous quarter and up 426,000 from a year ago. Part-time employment was up 59,000 from the previous quarter and up 17,000 from the year before at 8.56 million. There was an increase in self-employment, up 80,000 from the previous quarter and 63,000 from the year before to 4.84 million. The number of people working as employees was up 80,000 from the quarter before and up 415,000 from the year before to 27.59 million. 1.55 million people were employed on a temporary basis, up 38,000 from the previous quarter and up 16,000 from a year ago. 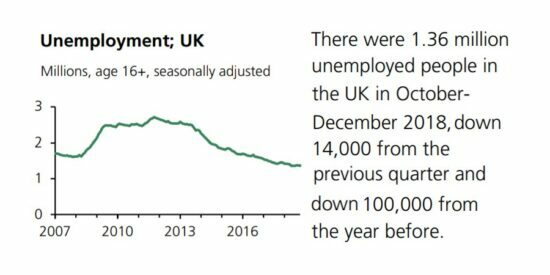 There were 1.36 million unemployed people in the UK in October December 2018, down 14,000 from the previous quarter and down 100,000 from the year before. The unemployment rate was 4.0% (the percentage of the economically active population who are unemployed). This is the joint lowest rate since 1975. After the 2008 economic downturn, the rate reached a high of 8.5% in late 2011. 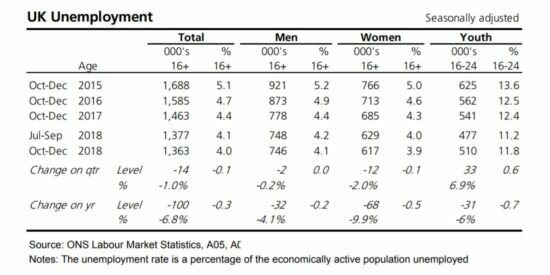 510,000 young people aged 16-24 were unemployed, up 33,000 from the previous quarter but down 31,000 from the year before. 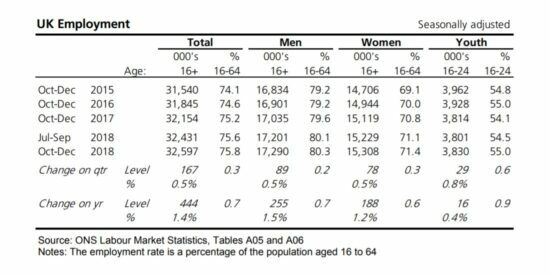 The unemployment rate for 16-24 year olds was 11.8%. 746,000 men were unemployed, a similar level to the previous quarter but down 32,000 from a year ago. 617,000 women were unemployed, down 12,000 from the previous quarter and down 68,000 from a year ago. The unemployment rates were similar for men and women. In October-December 2018, it was 4.1% for men and 3.9% for women. 350,000 people had been unemployed for over 12 months, 18,000 fewer than the previous quarter and 19,000 fewer than a year ago. The OECD produces harmonised unemployment rates for OECD members based on the ILO definition of unemployment. 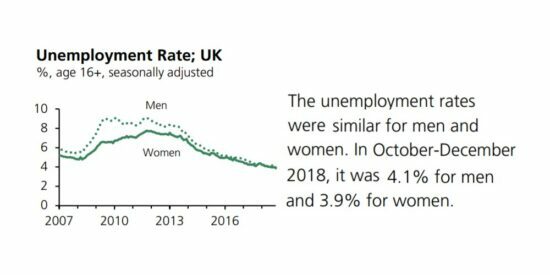 The UK harmonised unemployment rate for Q3 2018 was 4.1%. This was slightly above the rate of the US (3.8%), below that of France (9.1%) but above that of Germany (3.4%). The UK rate was the 13th lowest of the 36 OECD member countries. 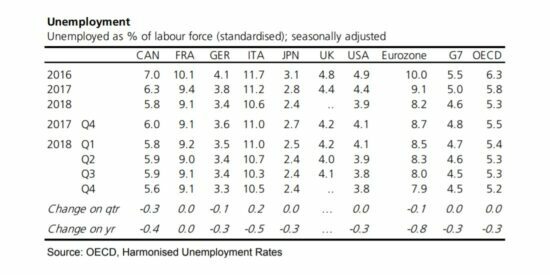 The unemployment rate for the Eurozone fell to 7.9% in Q4 2018 from 8.0% in Q3 2018, and was unchanged for the G7 at 4.5%. The Q4 figure for the UK has not yet been published. 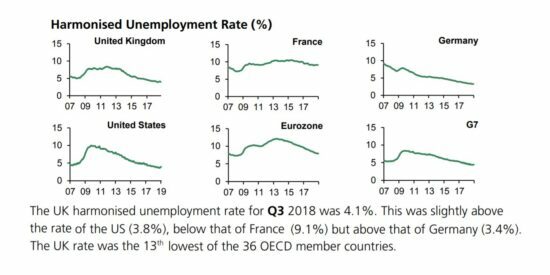 The majority of the OECD countries have seen a fall in the unemployment rate over the last year. Greece had the highest unemployment rate out of the OECD member states for Q3 2018 (18.9%) followed by Spain at 15.0%. The Czech Republic had the lowest unemployment rate in the OECD for Q2 2018 at 2.3%. Youth (aged 15-24) unemployment is a major issue in many developed economies at present. In Q3 2018 youth unemployment was 37.5% in Greece, 34.3% in Spain and 32.0% in Italy. 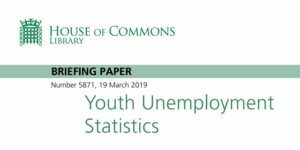 UK youth unemployment stood at 11.3%. Central banks around the world cut interest rates sharply during the 2007-2009 financial crisis. Rates remained at historic lows for many subsequent years close to or below 0% in most developed economies. The Bank of England’s Monetary Policy Committee (MPC) voted unanimously to leave interest rates unchanged at 0.75% at its February policy meeting. The last change occurred in August 2018 when the MPC raised rates from 0.5% to 0.75%. At its January policy meeting, the European Central Bank (ECB) left its main interest rate unchanged at 0.0%. New purchases of assets under its quantitative easing programme ended in December 2018. Under the scheme, the ECB now owns assets – mostly government bonds of Eurozone countries – worth €2.6 trillion. At its two-day policy meeting ending on 30 January, the Federal Reserve kept interest rates unchanged in a range of 2.25-2.50%. Rates have risen gradually since December 2015 from 0-0.25% against a backdrop of jobs growth and a stronger economy. The Government borrowed £21 billion in the current financial year to date (April 2018 to January 2019), £19 billion less than the same period in 2017/18. This represents the lowest level of borrowing for April to January since 2002. In December 2018, the ONS announced that it is changing how it accounts for student loans. This change isn’t yet reflected in the figures. The ONS aims to implement the change in September 2019. At the end of January 2019 public sector net debt was equivalent to 82.6% of GDP which is lower than at the end of January 2018, when the debt-to-GDP ratio was 83.4%. 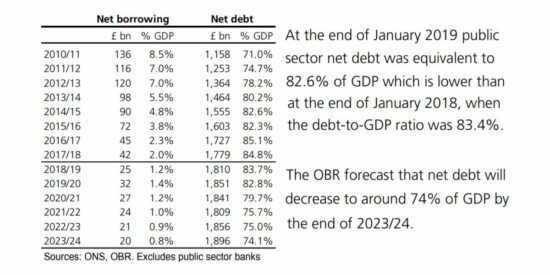 The OBR forecast that net debt will decrease to around 74% of GDP by the end of 2023/24. The FTSE-100 tracks the share prices of the 100 largest companies listed on the London Stock Exchange. 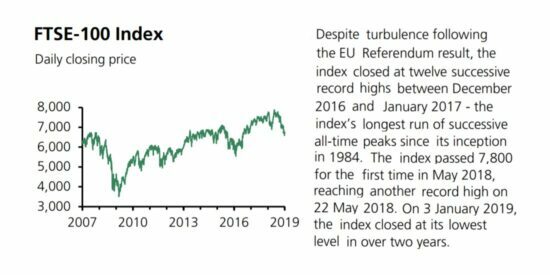 Despite turbulence following the EU Referendum result, the index closed at twelve successive record highs between December 2016 and January 2017 – the index’s longest run of successive all-time peaks since its inception in 1984. The index passed 7,800 for the first time in May 2018, reaching another record high on 22 May 2018. 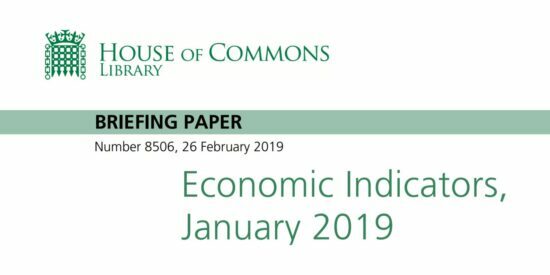 On 3 January 2019, the index closed at its lowest level in over two years. The price of Brent crude oil reached an all-time high above $145/barrel in July 2008. 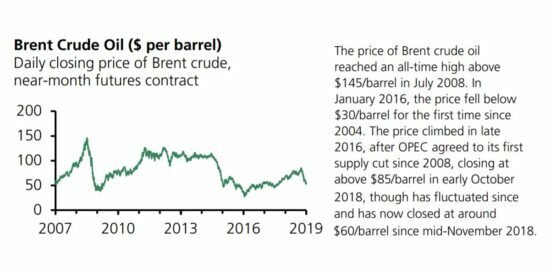 In January 2016, the price fell below $30/barrel for the first time since 2004. The price climbed in late 2016, after OPEC agreed to its first supply cut since 2008, closing at above $85/barrel in early October 2018, though has fluctuated since and has now closed at around $60/barrel since mid-November 2018. In 2018, the UK’s exports of goods and services totalled £629 billion and imports totalled £662 billion. The EU accounted for 45% of UK exports of goods and services and 53% of imports in 2017. Overall, the UK imports more than it exports meaning that it runs a trade deficit. A deficit of £139 billion on trade in goods was partially offset by a surplus of £106 billion on trade in services in 2018. The overall trade deficit was £32 billion in 2018. The UK had a trade deficit with the EU of £61 billion in 2017 and a trade surplus of £37 billion with non-EU countries. The trade deficit with all countries widened by £0.9 billion to £10.4 billion in the three months to December 2018 compared with the previous three months. Exports increased by 0.6 % over this period. Imports increased by 1.1% (both figures in cash terms). The current account, which includes investment income and transfers as well as trade, saw a deficit of £68 billion in 2017, compared with £103 billion in 2016. The current account deficit was 3.3% of GDP in 2017 compared with 5.2% in 2016. The current account deficit was £26.5 billion in Q3 2018 (5.0% of GDP), up from £20.0 billion (3.8% of GDP) in Q2 2018. 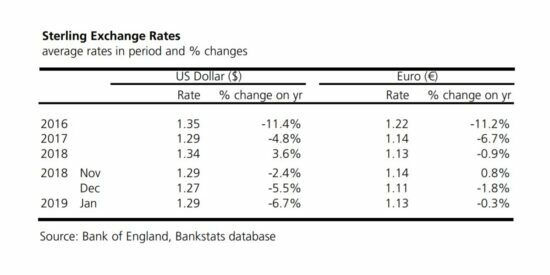 The Sterling Exchange Rate Index (SERI) measures sterling’s value against a ‘basket’ of currencies, ‘trade-weighted’ (based on currencies’ relative importance in UK trade). The SERI rose by 1.4% between December and January, following a fall of 2.0% between November and December. This is the SERI’s largest month on month increase since April 2018. Compared with the same period a year ago, it is 4.3% higher. It is 26.3% below its January 2007 peak level. On average in January compared with December, the pound rose by 1.9% against the dollar, following a fall of 1.9% between November and December. The pound fell sharply against the dollar following the EU referendum, from $1.48 on 23 June 2016 to $1.14 in June 2017 – 31 year low. 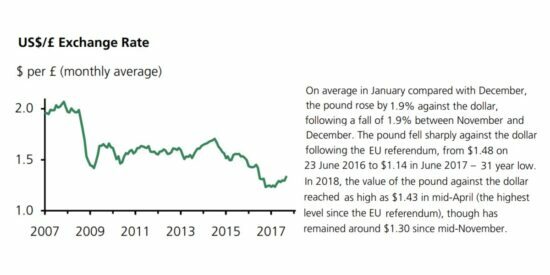 In 2018, the value of the pound against the dollar reached as high as $1.43 in mid-April (the highest level since the EU referendum), though has remained around $1.30 since mid-November. Sterling was up 1.5% against the Euro on average in January compared to December. On 7 February 2019, the Euro was valued at €1.14 per £1. 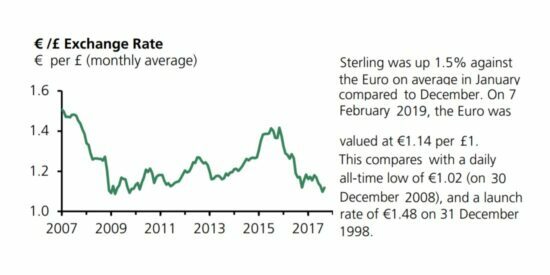 This compares with a daily all-time low of €1.02 (on 30 December 2008), and a launch rate of €1.48 on 31 December 1998. Confidence surveys, with information generally released ahead of official statistical data, can indicate changes to the economic outlook as well as turning points in the economic cycle. The European Commission conducts regular harmonised surveys for different sectors of EU member states’ economies. 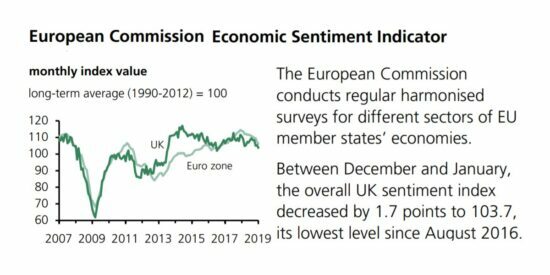 Between December and January, the overall UK sentiment index decreased by 1.7 points to 103.7, its lowest level since August 2016. 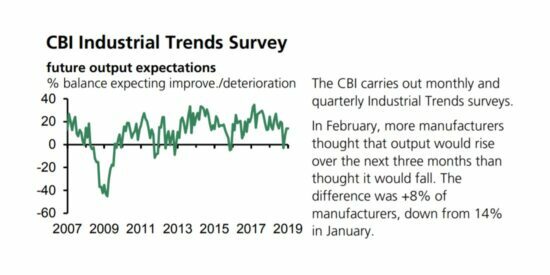 The CBI carries out monthly and quarterly Industrial Trends surveys. In February, more manufacturers thought that output would rise over the next three months than thought it would fall. The difference was +8% of manufacturers, down from 14% in January. 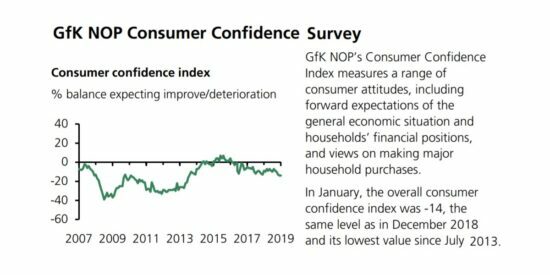 GfK NOP’s Consumer Confidence Index measures a range of consumer attitudes, including forward expectations of the general economic situation and households’ financial positions, and views on making major household purchases. In January, the overall consumer confidence index was -14, the same level as in December 2018 and its lowest value since July 2013. In January 2019, retail sales in the UK totalled £6.6 billion per week, down from £9.4 billion per week in December 2018. This figure includes money spent in shops, supermarkets, in petrol stations and online. 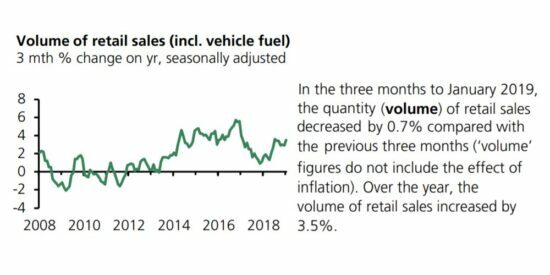 In the three months to January 2019, the quantity (volume) of retail sales decreased by 0.7% compared with the previous three months (‘volume’ figures do not include the effect of inflation). Over the year, the volume of retail sales increased by 3.5%. The average weekly value of internet sales in Great Britain was £1.2 billion in January 2019, the highest ever. This was 18.8% of all retail sales, down from 19.8% in December 2018. 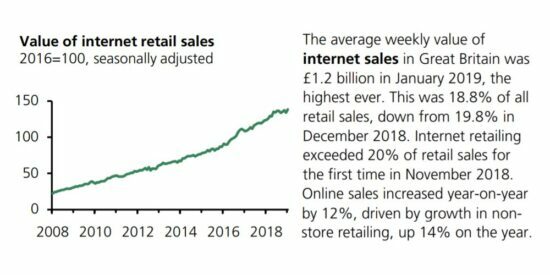 Internet retailing exceeded 20% of retail sales for the first time in November 2018. Online sales increased year-on-year by 12%, driven by growth in non-store retailing, up 14% on the year. 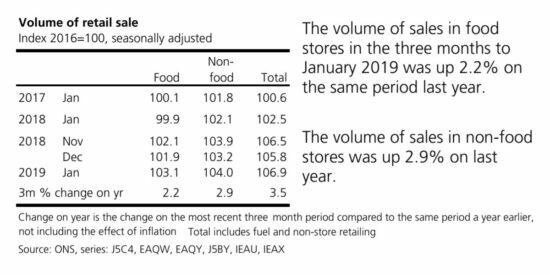 The volume of sales in food stores in the three months to January 2019 was up 2.2% on the same period last year. The volume of sales in non-food stores was up 2.9% on last year. Seasonal adjustments estimate and remove calendar effects (for example Easter moving between March and April) and seasonal effects (for example increased spending in December as a result of -4 Christmas). House prices, as measured by the UK House Price Index, increased by 2.5% between December 2017 and December 2018. On a seasonally adjusted basis house prices increased by 0.2% between November 2018 and December 2018. There are regional differences in house prices. 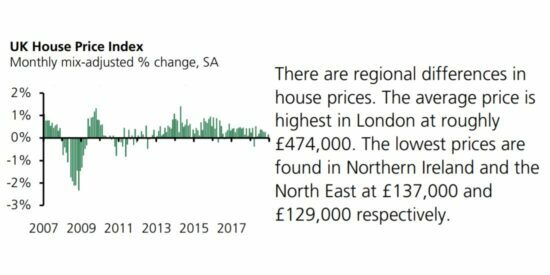 The average price is highest in London at roughly £474,000. The lowest prices are found in Northern Ireland and the North East at £137,000 and £129,000 respectively. Bank of England data on the number of mortgages approved to finance house purchases are a leading indicator of house sales. 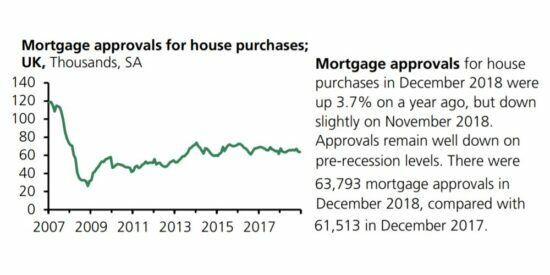 Mortgage approvals for house purchases in December 2018 were up 3.7% on a year ago, but down slightly on November 2018. Approvals remain well down on pre-recession levels. There were 63,793 mortgage approvals in December 2018, compared with 61,513 in December 2017. Housing starts and completions have increased from the lows observed in late 2008 and early 2009 but remain below pre-recession levels. 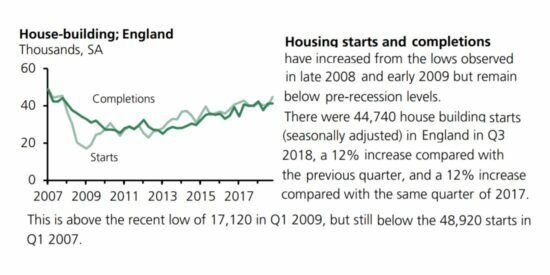 There were 44,740 house building starts (seasonally adjusted) in England in Q3 2018, a 12% increase compared with the previous quarter, and a 12% increase compared with the same quarter of 2017. This is above the recent low of 17,120 in Q1 2009, but still below the 48,920 starts in Q1 2007. There were 41,270 dwelling completions (seasonally adjusted) in Q3 2018, broadly similar to the previous quarter and a 3% increase compared with the same quarter of 2017. Completions remain below the peak of 48,430 completions in Q1 2007. Household debt peaked in Q2 2008 at 148% of household disposable income. 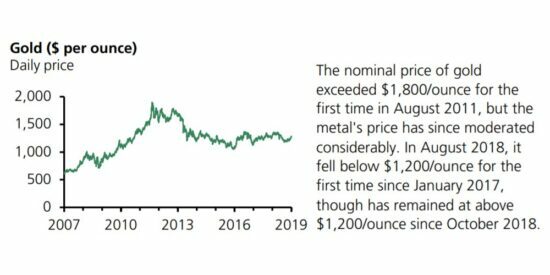 It then declined to 127% by late 2015. 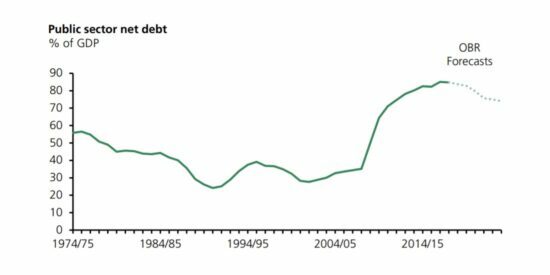 Growth in household debt levels accelerated from early 2016, so that the debt-to-income ratio rose again to 134% by mid-2017. In Q3 2018 it was 133%. 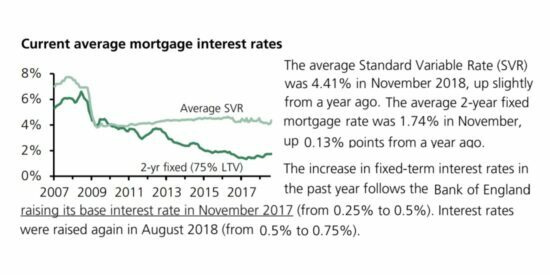 The average Standard Variable Rate (SVR) was 4.41% in November 2018, up slightly from a year ago. The average 2-year fixed mortgage rate was 1.74% in November, up 0.13% points from a year ago. The increase in fixed-term interest rates in the past year follows the Bank of England raising its base interest rate in November 2017 (from 0.25% to 0.5%). Interest rates were raised again in August 2018 (from 0.5% to 0.75%). 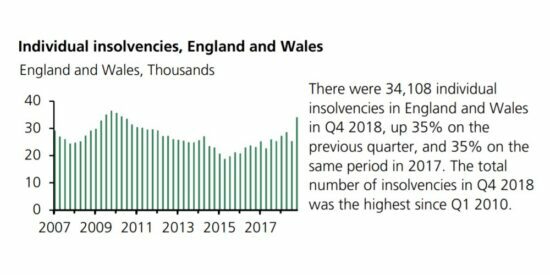 There were 34,108 individual insolvencies in England and Wales in Q4 2018, up 35% on the previous quarter, and 35% on the same period in 2017. The total number of insolvencies in Q4 2018 was the highest since Q1 2010. In Scotland, there were 3,198 individual insolvencies in Q4 2018, the highest since Q4 2013. In Northern Ireland, there were 615 individual insolvencies in Q4 2018, up 4% on the quarter. Capital account: the difference between a country’s capital invested in other countries, and the capital invested by other countries in it. Technically, the two parts always balance. A balance of payments deficit normally refers to a current account deficit. Balance of trade: The difference between a country’s exports and imports of either goods only or goods and services combined. 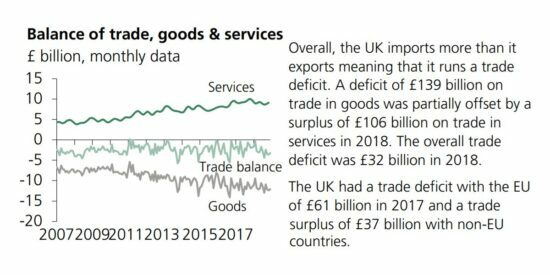 Trade in financial services account for around a third of UK exports, and thus partially offsets trade in goods deficits. Basic prices: Prices excluding taxes and subsidies on products. Allowance (JSA) benefits. This includes out-of-work Universal Credit claimants. Consumer Prices Index (CPI): This is the headline UK domestic measure of inflation. It measures the average change from month to month in the prices of consumer goods and services purchased in the UK. 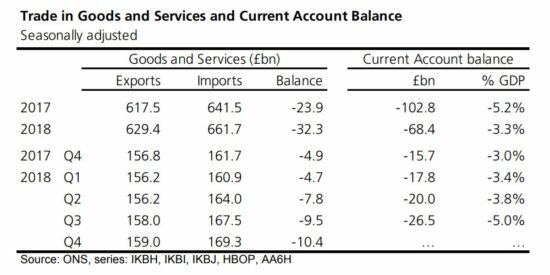 Current account balance: The difference between receipts/payments due to transactions in goods, services, income and transfers between the UK and all other countries. A current account deficit means that total payments exceed total receipts; in the reverse case, the current account is in surplus. Current budget: Measures the balance of public sector current account revenue over public sector current expenditure. Current/constant prices: Current prices are the actual or estimated recorded monetary value over a defined period for a group of industries or products. They show the value for each item expressed in terms of the prices of that period. Constant prices refer to volume measures whose values are derived by applying to current quantities, prices for a specific base period. They allow figures to be represented so that the effects of inflation are removed. The values for each time period are expressed in terms of the prices in a particular base period. Employment: The number of people with jobs as estimated by the Labour Force Survey (LFS). This includes all people aged 16 or over who did paid work, those who had a job that they were temporarily away from, those on government supported training and employment programmes, and those doing unpaid family work during the survey period. The employment rate refers to the number of people employed as a percentage of the working age population as measured by the LFS. Exchange rate: The rate at which one currency is traded against another. Gross Domestic Product (GDP): The total market value of goods and services produced after deducting the cost of goods and services used up in the process of production (intermediate consumption) but before deducting consumption of fixed capital (depreciation). Gross Domestic Product – Real GDP: Also known as constant price or chained volume measure, this is a measure used to indicate change in the actual quantity of goods and services produced, by adjusting for inflation. Gross Fixed Capital Formation (GFCF): Expenditure on fixed assets (buildings, vehicles etc.) either for replacing or adding to the stock of existing assets. Business investment is GFCF by the private sector and public corporations on transport equipment, other machinery and equipment and new dwellings and structures other than dwellings. Gross Value Added (GVA): The difference between output and intermediate consumption for any given sector/industry. That is the difference between the value of goods and services produced and the cost of raw materials and other inputs which are used up in production. GVA is used to measure the productivity of sectors/industries and economies. Harmonised Indices of Consumer Prices (HICP): Harmonised indices of consumer prices for Member States of the European Union, which enable comparisons to be made across countries. The UK’s CPI measure uses HICP methodology. Market prices: The prices actually paid by the purchaser for goods and services, including transport costs, trade margins and taxes. GDP at market prices = GDP at basic prices + transport prices paid separately + non-deductible taxes on expenditure – subsidies received. Money supply: The total amount of money in an economy at a given time. The Public Sector Net Borrowing (PSNB): This measures the public sector’s accumulation of debt net of liquid financial assets. Its approximate stock equivalent is net public sector debt. Retail Prices Index (RPI): A domestic indicator of inflation. It measures the average change from month to month in the prices of goods and services purchased in the UK. It is similar to the CPI, but differs in terms of methodology and coverage. For example, the RPI includes housing costs such as mortgage interest payments while the CPI doesn’t. Seasonally adjusted: Estimates in which the element of variability due to seasonal influences, which may distort the data, has been removed. 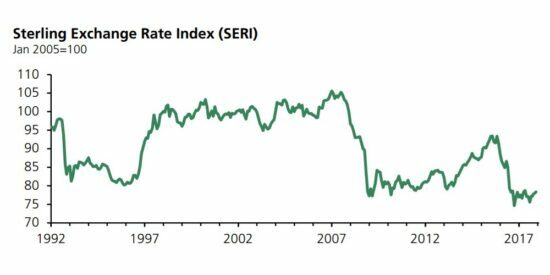 Sterling Exchange Rate Index (SERI): This measures the value of sterling against a trade-weighted ‘basket’ of other currencies. 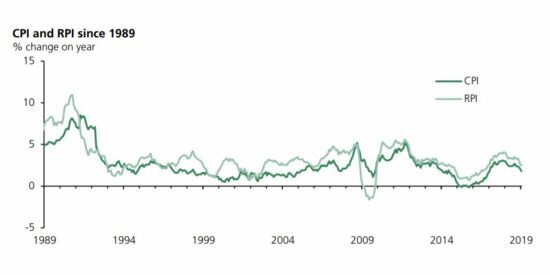 The weights used in this index measure currencies’ relative importance to UK trade in goods and services. UK Base/Repo rate: The rate at which the Bank of England lends to discount houses by buying their bills. The base rate is usually the minimum rate at which banks are prepared to lend money. The high street bank base rate follows that set by the Bank of England, and it acts as the benchmark for other interest rates, including mortgages and personal loans. Unemployment: The ILO definition includes all people who are: out of work, want a job, have actively sought work in the previous four weeks and are available to start work within the next fortnight; or are out of work and have accepted a job that they are waiting to start in the next fortnight. Unemployment rate: The number of unemployed persons expressed as a percentage of the total economically active population. Volume/value of retail sales: The volume of retail sales is the total takings adjusted for inflation and the value of retail sales is the total actual takings. Workforce jobs: The sum of employee jobs, self-employment jobs, those in HM Forces and government-supported trainees. 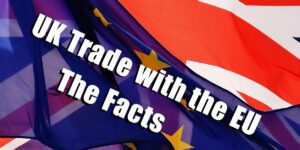 1 Sources: ONS, HM Treasury, HM Revenue and Customs, Finance-Glossary.com.